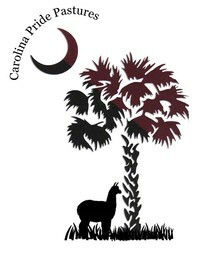 Carolina Pride Pastures, LLC is an alpaca farm located in Pomaria, South Carolina owned by Alicia Holbrook. Open to all levels of Girl Scouts. Activities at Lever Farms and Carolina Pride Pastures will earn an Outdoor Art Badge and a fun patch at the strawberry patch. 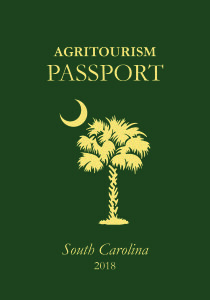 Depart Lever Farms and arrive at Carolina Pride Pastures! Troops will tour the farm and complete a craft for their Outdoor Art Badge. Carolina Pride Pastures will have bottles of water on hand. Troops are encouraged to bring a snack or bagged lunch. Troop leaders, please contact Alicia Holbrook at 803-480-3750 to schedule your arrival time. Arrival times begin at 8 AM with last arrival time at 3 PM. The two-farm tour will take between 2 and 3 hours. The Create your Own Alpaca event has been postponed due to a family event. Stay tuned for the new day and time. NEW FARM STORE HOURS!! We will now be open every Saturday* from 10-2. Shop and visit with the herd! Our spring field trip calendar is starting to book. Contact us today to start planning your group's next outdoor adventure to explore all of the new additions at the farm. Our farm was recently awarded an educational grant. 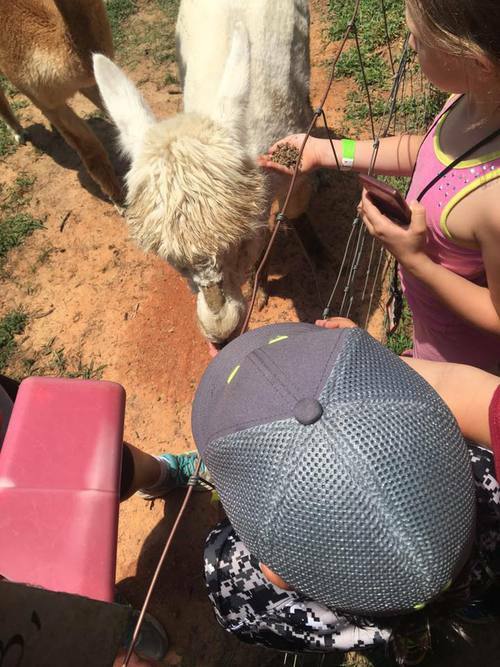 In addition to learning about the camelid family, visitors will explore water conservation, the importance of pollinators, a worm farm, and so much more! *During the months of Jan, Feb, June, July, and August, the farm store may or may not be open due to alpaca shows, vacations, and more. Feel free to call or e-mail us to ensure we are open. 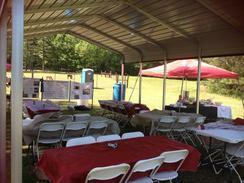 Our covered shelter provides a place for students to eat lunch and learn. Students interacting with the herd. 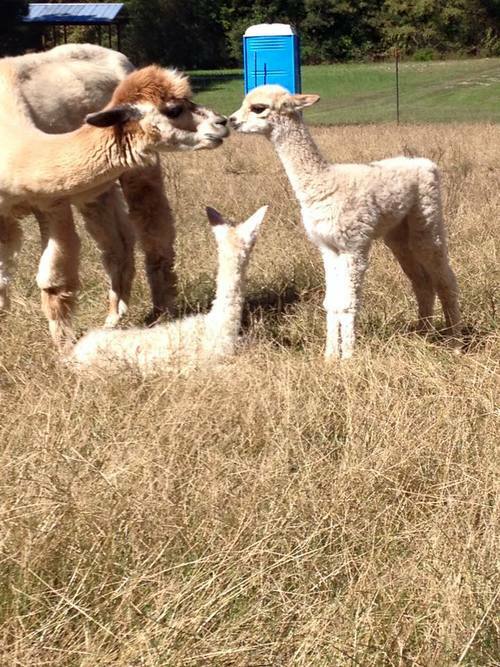 Storm (cria) giving kissing to the new mom. Big Sky has just been born! Carolina Pride Pastures is an alpaca farm featuring huacaya alpacas and 1 Suri alpaca. The farm specializes in farm tours, educational seminars, fleece sales, and alpaca fertilizer. Alicia Holbrook, owner, and her husband, Eric started the farm after Alicia watched a late night show on the animals after the birth of their second daughter. Eric loved the idea, which is rare!!! After they attended a seminar on the animals, they decided to make the investment. Over the course of two years, Alicia and Eric purchased land, built a barn, and fence. With the help of some great family members, the entire project was completed in November, 2013. Since the arrival of the starter herd of 5 pregnant females in November 2013, the herd has welcomed 9 crias over the past three years. They are hoping for 2 more crias this spring! The farm is protected by llamas and a Great Pyrenees named Elysa. Alicia graduated from the University of South Carolina with a degree in Business. After over a 10 year career in Human Resources, Alicia gave up her career to be a stay-at-home mom of two smart and beautiful girls. Eric works for a nearby OSB facility where he is a reliability technician. For your safety and for the protection of our land and animals, we ask that you read all the rules and guidelines listed below. Please observe and follow ALL notices and signs. 1. Absolutely NO THROWING of feed, rocks, sticks, etc. 2. We love dogs but please don’t bring yours to the farm. Our guard animals may see them as a threat to the alpacas. 3. Alpacas only have teeth on the bottom. When feeding the alpacas, use a flat hand to ensure your hand is not pinched. 4. Please do not bring food from home for the farm animals. 5. Absolutely no smoking is allowed on the farm! Anyone smoking will be asked to extinguish their cigarette or cigar and/or asked to leave. 6. No weapons or costume weapons that give the appearance of being real are allowed on the farm. 7. To make this a fun & educational experience for all, we ask that you please WATCH, MAINTAIN & CONTROL your children. Please read and obey all signs as they are intended for the safety of all. 8. Please be careful when walking around our fields. The ground can be uneven and fire ant mounds can appear overnight. 9. DO NOT open any farm gates. 10% down. 24 month financing.